Postdoctoral fellow Naveeda Khan, who will join the Anthropology faculty in 2006, uses readings, movies, response papers and class discussions to explore modern-day thought processes. The course: Magic, Science, Religion. 3 credits. Offered by the Department of Anthropology in the Krieger School of Arts and Sciences. Cross-listed with Humanities. 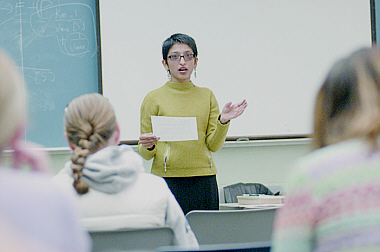 The instructor: Naveeda Khan is a postdoctoral fellow in the Department of Anthropology; she will begin her tenure as an assistant professor in 2006. She received her master's in anthropology from the New School for Social Research in 1995 and earned her doctorate in anthropology from Columbia University in 2003, writing her doctoral dissertation on how sectarian violence is folded into everyday life in urban Pakistan. She is the recipient of numerous research grants from foundations such as the Social Science Research Council, National Science Foundation and Wenner-Gren Foundation for Anthropological Research. Khan has worked for the Bangladesh Rural Advancement Committee, United Nations High Commissioner for Refugees and Field Museum of Natural History in Chicago. She is turning her dissertation into a book tentatively titled "The Passage of a Promise: Spaces of Worship, Sectarian Violence and Embodied Skepticism in Urban Pakistan" and is co-editing a book of essays on contemporary Pakistan titled Beyond Crisis: A Critical Second Look at Pakistan. Syllabus: Scholars throughout the ages have spent a lot of time conducting intellectual and experimental research on the human thought process. The study of magic, science and religion is perhaps anthropology's most enduring contribution to this pursuit. By debating rationality vs. irrationality, human relations to nature and newness vs. tradition, this course draws for its students a variegated picture of thinking and thought. Throughout the semester, the readings, class discussions and writing assignments encourage students to consider how we think, what the predominant modes of thinking are and what produces a change in thought. Students use the information gleaned from theoretical readings to analyze ethnographies and films of modern-day instances of magic, science and religion to draw out the dominant pictures of modern-day thought. Course work: Students write six three-to-four-page "response papers" tied to class readings. Specific assignments guide the first four papers, but students follow their own leads for the remaining two papers discussing two of the three ethnographies to be read at the end of the course. Deadlines are strict so that Khan and her teacher's assistant, Andrew Bush, have time to grade papers and incorporate students' thoughts and ideas into relevant class discussions. The final grade incorporates Khan and Bush's evaluation of class attendance and participation and the cumulative letter grades on response papers. Required reading: In addition to many books and articles on reserve in the library, students must read Witchcraft, Oracles and Magic Among the Azande, by E. E. Evans-Pritchard; On Creativity, by David Bohm; Persuasions of the Witch's Craft: Ritual Magic in Contemporary England, by T.M. Luhrmann; Beamtimes and Lifetimes: The World of High Energy Physicists, by Sharon Traweek; and Landscapes of Jihad: Militancy, Morality, Modernity, by Faisal Devji. Required movies: Cabeza de Vaca, directed by Juan Diego, 1993; Solaris, directed by Andrei Tarkovski, 1971 (English subtitled version, 1989); Last Temptation of Christ, directed by Martin Scorsese, 1988; and Monty Python's The Life of Brian, directed by Terry Jones, 1979. Overheard in class: "For the ancient Greeks, Nature was characterized by constant motion, which was taken to be the energy of its soul. Organic life, vegetal and animal, was taken to be its physical body. At the same time, it was believed that Nature had a mind of its own that gave order to this psychic and physical world. Thus to the Greeks these disparate parts of Nature comprised a self-contained totality, much like the human body ... . The modern view of Nature is not concerned with what Nature's mind may be. Rather Nature is characterized regularity, capturable by laws. With the introduction of the biological theory of evolution, the idea of life as a vital force that moved Nature, that caused it to change, emerged." Students say: "I decided to take this course because I enjoyed Dr. Khan's class Anthropology of the Senses last fall . Also, I am very interested in spirituality, mysticism and the ways in which our human perceptions of these topics affect our social structures and our personal and collective thought processes. I enjoy the class very much. Dr. Khan organized the course well, in such a way that we have been learning to apply basic concepts from the readings and movies to larger pictures of the world. The readings, movies and assignments are all very thought-provoking, and she encourages creativity. Another wonderful feature of Dr. Khan's teaching style is her desire and ability to connect her anthropology classes to other fields of study. For example, we often discuss philosophical issues, such as the mind-body problem. Also, she invited a graduate student from the Physics Department to speak to us during our science portion of the course. She loves to learn as much as she loves to teach, so she asks us to contribute our own analyses of the readings to class discussions, and she readily answers our questions while asking us to answer some of her own. Her enthusiasm and incredible wisdom have inspired me to eagerly pursue my academic interests and enjoy the process of learning." — Rachel Day, 20, a junior from Fishers, Ind., who is majoring in anthropology with a minor in psychology.